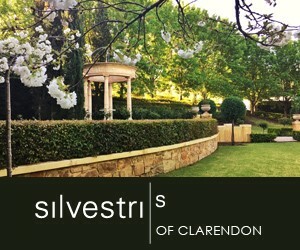 Set in the beautiful Adelaide Hills township of Clarendon, Silvestri’s of Clarendon is a blend of contemporary design and heritage features. The venue was created around a gracious 150 year old sandstone villa and includes a ballroom, restaurant dining room, separate cocktail bar, wine cellar, large sandstone terrace and manicured wedding garden. Set on one acre of land, the property’s entrance is framed with stately wrought iron gates lending the restaurant building, and its manicured gardens, the presence of an exclusive private estate. The Ballroom evokes an atmosphere of modern glamour and elegance. Ideal for groups of up to 140 guests, it is surrounded by large glass doors that open onto our sandstone terrace, which overlooks our eight metre long waterfall and beautiful gardens. The Restaurant Dining Room seats up to 40 seated guests. This elegant room is perfect for more intimate celebrations. It has gold-framed mirrors, antique furnishings, and Louis XVI chairs. French doors open onto our sandstone terrace and there are two open fireplaces. Our Wedding Garden features more than 40 ivory coloured roses, lush lawns, manicured hedges and a sandstone grecian temple. It is considered Adelaide’s most photogenic ceremony location by many top photographers. Every event is handled with care and attention to detail by our dedicated and passionate staff as we work with you to achieve an unforgettable celebration.